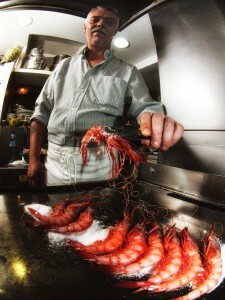 The email I got regarding this place was that the speciality prawn dish cooked on a bed of salt was the shoot needed. The space was very cramped, it was impossible to use a brolly on the flash fully open, there were all sorts of hot spots with the stainless steel panelling. Even with a fish eye lens the camera was right up against the back plate and my hand was touching the grill that was getting steadily hotter, this shot was possible because my camera has a flip out LCD screen, otherwise it would have all been guess work, and I would of found it impossible to frame it as accurately as this, which is an uncropped shot. Normally one tries to get a variety of shots but the place was still closed, without customers and I had to do some other shots that evening, seeing this shot on the LCD though I knew it perfect for what they wanted.